If you are willing to pay $30,000 for a ultra-modern waterbed, than the Tranquility Pod will do. This 6-foot waterbed is embraced by a big octagonal and 50 LED-lights. There’s also a four-speaker sound system so you can listen to your favorite music while trying to fall asleep – although we don’t think you’ll need music to fall in a very deep sleep on this temperature-controlled, soft bed. But in any case, if you have horrible insomnia, the 50 LED lights inside the bed will adjust to your mood. It’s synchronized to your heart rate, so when the bed feels your falling asleep, it plays the perfect music to make sure you’ll dreaming soon enough! 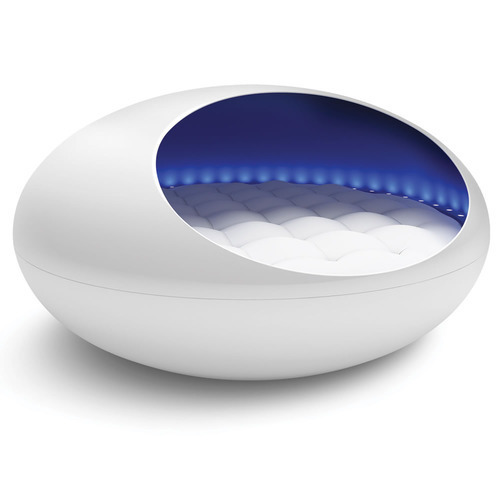 For more information or to order your own Tranquility Pod bed, click here.